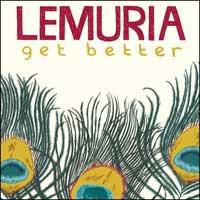 What saves Lemuria to such a high degree, particularly for the audience whose formative years took place in the days of Pauly Shore and alternative rock, is how well they grasp ‘90s nostalgia without breathing the irony of nostalgia into their music. This full-length debut from the Buffalo trio is realistic storytelling from the original emo perspective, with vocalists resembling ‘90s heroes like Anna Waronker, or an Adam Green/Matthew Caws hybrid (these new renditions being guitarist Sheena Ozzella and drummer Alex Kerns, respectively). There’s a lot of self-pity here, and even a bit of preachiness (“Everybody wants more, when they already have some”), but this is a bona fide college mope, set in tune to a small piece of the ‘90s revival that’s already on its way. And the ‘90s were just plain rad. And if you turn them down to background volume, it's almost kinda like listening to Avril Lavigne. But an awesome Avril Lavigne. From 1993. See them on tour with the Queers!